Please, Do Bring on the Cheese Fondue! Ah, cheese fondue! The aroma of meltingly pungent cheese and wine – bubbling gently and ready for dippers of bread. It’s a romantic dinner for two, or a wonderful ice-breaker for a party or get-together. It’s the perfect meal to foster intimate conversation and create lasting memories of good times by all. Cheese fondue can be used as a meal, or as an appetizer. The pots made for cheese fondue are of heavy, heat resistant earthenware or heavy metal. A controllable heat unit that maintains low, even heat is what keeps the cheese melted and slightly bubbly without burning the cheese or over heating it. You want the consistency to be smooth and sauce-like. If you don’t have a fondue pot, you can also use a casserole dish or one of ceramic material – it must be heat resistant! Use it over a well-regulated alcohol, canned heat, or butane flame. You can also try it over an electric hot plate or candle warmer, although this is not recommended! Other types of fondue pots are the classic fondue bourguignonne pan, electric fondue pots and chafing dishes. If your heat source isn’t manageable, you will end up with cheese that cools too much and the result is a big glob of hardened cheese that becomes undunkable. If your heat source is too hot, the cheese ends up being stringy and starts to separate into a globby, gooky mess. It’s not as hard as it seems. That’s why making a small investment into a real fondue pot is worth it. Your fondue pot usually comes packaged with the right style of forks, your controllable heat source and a pan that was made for this kind of cooking. 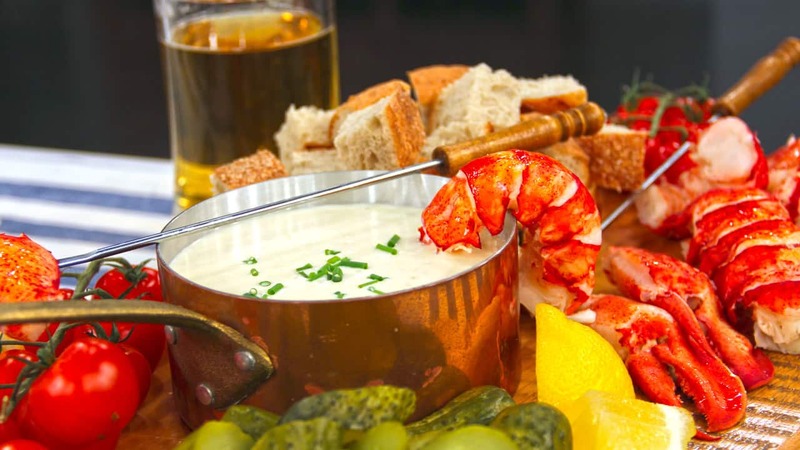 Okay, ready to try out a great cheese fondue recipe? Look no further! I have them all right here for you. Create your own memories. Make your guests smile. Treat your family to something entirely different than Hamburger Helper. You’ll be happy you did! If you choose to use processed Swiss cheese, just be aware that it tends to thicken up more readily than natural cheese and normally needs to be thinned if it stands very long. First, heat the buttermilk and garlic halves in a pot. Once the buttermilk is heated through, remove the garlic halves. Don’t bring to boiling point. Then combine the cheese, flour, and seasoned salt. Add to the hot liquid by small handfuls and stir until all the cheese is uniformly melted and blended. Next, place the buttermilk cheese sauce mixture over a low flame (your canned heat or equivalent) to keep the cheese simmering gently – you don’t want it to boil! You might find you’ll need to add a little more of whatever liquid you have left to keep the cheese properly thinned and for a good dipping consistency. This yummy recipe serves 5 or 6 as an appetizer and easily serves 2 for a meal. For a variation on the theme, try Swiss Cheese Dipping Sauce. *Some other dipper ideas are small cubes of cooked ham and toast to dip into the melted cheese. Chill your tender asparagus spears and serve with the Keilbasa. Can also be served with cherry tomatoes and rye bread slices. At the table dip your dippers into the cheese and use the rye bread to catch the drips from pot to plate. YUMMY!